If Electron is used directly, then some manual setup is needed before building your application. Also if you want to use angular, react, vue or any other framework or library, you will need to manually configure for that. Electron Forge makes the above things much easier. It provides template applications with angular, react, vue and other frameworks. This avoids the extra manual setups needed. Also it provides an easy way to build and package the application. It also provides many other features which can be found in their documenation. The above command will take some time to run. It has information about the application you are creating, it has all the dependencies needed for the app and also it has some scripts. Some of the scripts are already pre configured and you can add new scripts as well. The config.forge path has all the configurations which are specific to ElectronJS. For example make-targets is used specify the target make files for various platforms like Windows, Mac or Linux. According to package.json, index.js is the main script. The process which runs the main script is known as the Main Process. So Main Process runs the index.js script. The main process is used to display GUI elements. It does this by creating Web Pages. The purpose of the Main Process is to create web pages using a BrowserWindow Instance. The BrowserWindow Instance uses a renderer process to run each Web page. It is possible to communicate between the main and the renderer process as well. This will not be covered in this article. abcd.html is shown as a second webpage in the above architecture. But in our code we won’t be having a second web page. index.js loads the index.html file into a new BrowerWindow Instance. What this basically means is that, index.js creates a new GUI Window, and loads it with index.html web page. 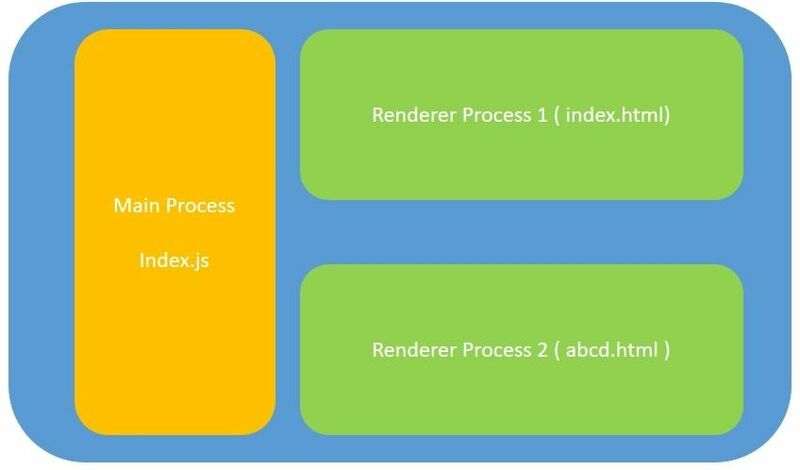 The index.html web page runs in its own renderer process. The above code snippet basically creates a BrowserWindow Instance and loads index.html into the BrowserWindow. You would see app used often in the code. For example take the below code snippet. app is used to control the applications’s event life cycle. The above code snippet says that when the application is ready, load the first window. Similarily app can be used to perform other actions on various events. For example it can be used to perform some action right before the application closes and so on. 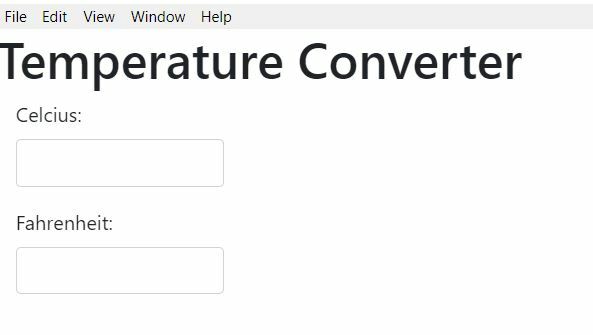 Let us use the same application we used before and modify it slightly to create a temperature converter application. Creates a text box with id celcius. whenever anything is typed in this textbox, celciusToFahrenheit() function is called. Creates a text box with id fahrenheit. whenever anything is typed in this textbox, fahrenheitToCelcius() function is called. Create a file called renderer.js inside src. Copy the following code into it. celciusToFahrenheit() function reads the value in celcius text box, converts it to fahrenheit and writes the new temperature into fahrenheit text box. fahrenheitToCelcius() function does the exact opposite of this. This should display the following window. Try it out with different values. This command will take some time to run. Once it finishes check the out folder within the project folder. So in the out/simple-desktop-app-electronjs-win32-x64 folder, the command creates an .exe file for this application. 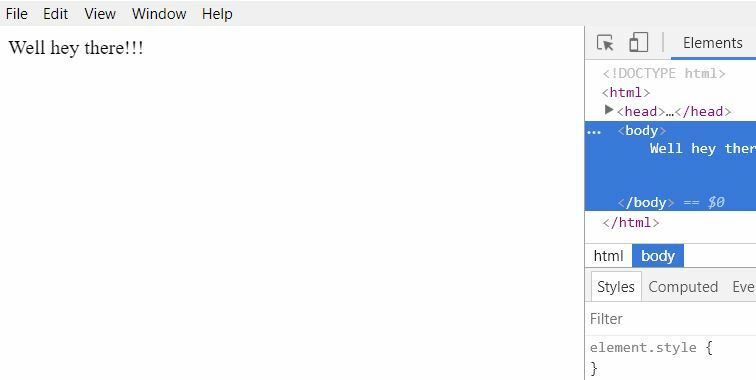 Clicking on the exe file automatically starts the desktop application. This will create a folder called as simple-desktop-app-electronjs-linux-x64 inside out folder. The out/make folder will have a windows installer for the desktop application. This article covered very basic concepts of electron and electron-forge. To know more about them, you can checkout their documentation.